A good example of a player flopping strong but then taking the idea of trapping one step too far. He who hesitates is lost: A player flops a strong hand but then slow plays himself into submission. Sometimes we face aggression while holding a strong hand — a welcome surprise. But sitting back and letting our opponent do the betting isn't always the answer. We need to think about their entire range, and how best to charge it. Here's a hand from the 100NL short-handed online cash tables that provides a good example of a player taking the idea of trapping one step too far. The flop comes , and the big blind decides to lead out for $4 into a pot of just over five bucks. This is a bit unusual since the flop would not seem clearly to favor the big blind over the button. Also, if the big blind had flopped something strong, he could expect most players in the button's shoes to continuation bet when checked to (meaning the BB could check-raise and build a big pot with big hands). That said, , , , , and are all reasonable defends from the big blind's perspective. He would only necessarily have three-bet , , , and , looking at the strongest hands with this flop. In any case, the button called and the came on the turn, putting a second spade on the board. Again, the big blind decided to lead, this time for $11 into about $13. The button can raise before the flop and call the flop bet with many hands, while the big blind would likely check-call his strongest ace-high hands on the flop (not bet them). Once again, as was the case on the flop, this turn seems to favor the button's range, given the flop action. Yet it is the big blind who is betting it. When such is the case, much points in favor of the button raising. He can raise his value hands, since he should have a good number of them, his semi-bluffs, and even some pure bluffs. The contention would be that the big blind is out of line. This isn't their card, their board, and therefore, their place, to be taking big shots at this pot. Hands like , , , , , , , , , , , and any two unpaired spades would make sense for the button to raise. Depending how out of line he believes the big blind to be, he could add in weaker hands as well. After all, if he has all these strong hands, and these strong hands are raising, the big blind cannot simply disbelieve him. Rather, the button can take liberties with the rest of his range. Let's think about big blind's range for a moment. It seems quite unlikely that he would bet a bare king — e.g. or — on this turn card. Therefore he either has a made hand (that was made on the flop), or he has a draw. Now that the turn is an ace, many draws are possible (e.g., , , , , , , ). The main thing the button should realize is that he is not going to get any value from these gutshot and open-enders on the river if they miss. (And if they hit, well, he's not getting any value, either.) In other words, the time to raise for value is now. But in actual fact, the button called. In the climax of this hand, the river produced an offsuit four — the — making the final board . The big blind continued apace, betting $45 into $35. The button responded by shoving all in with for set of sevens, having slow played all the way to the end. But when the big blind snap-called, the button was bested by for a rivered straight. In other words, the button had missed his turn-raise and instead slow played himself into submission. 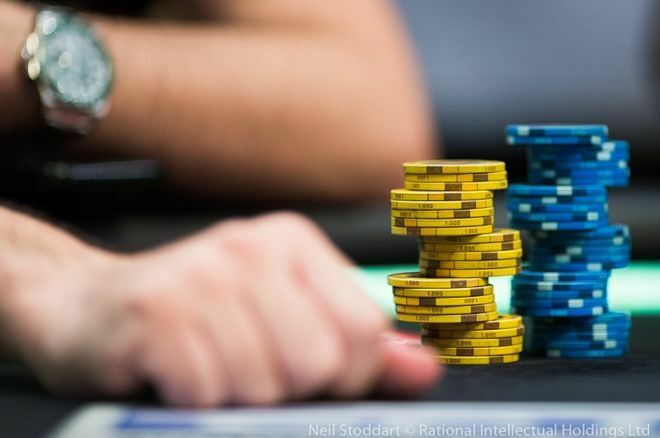 Flopped Set of Nines: Get All In on Flop or Wait? If you think current popular rap is bad, you should hear the average middle or high school kid rapping. Sounds just like it.